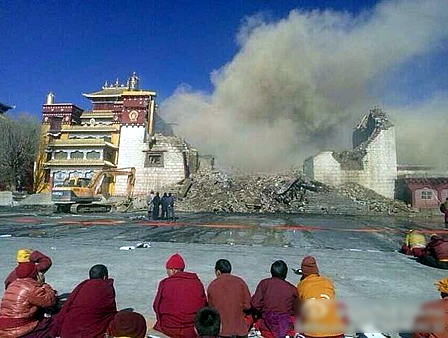 Is China’s Regime Fire-Bombing Tibetan Monasteries? 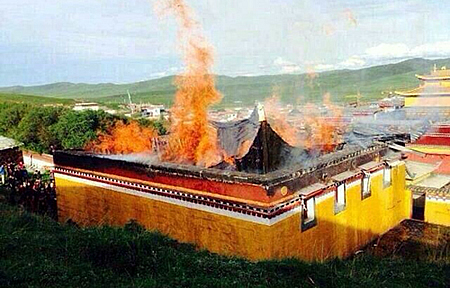 Yet another Tibetan monastery has been engulfed in flames, Taksta based in Zoege County in Eastern Tibet’s Kham region was struck by a raging inferno on Monday June 30, with the main prayer hall suffering the greatest damage. This latest fire follows two other blazes one earlier this year and another in November 2013 badly damaging Buddhist temples, also located in Kham. All are hugely important and influential centers, associated with historic and more recent opposition to China’s vicious and illegal occupation of Tibet. 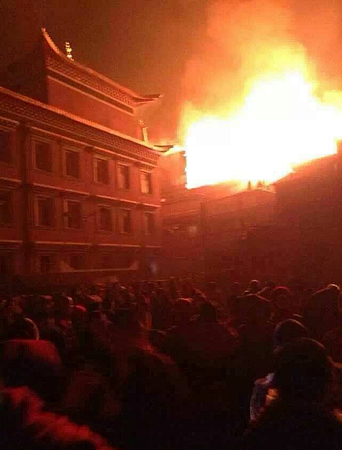 On November 16 2013 Lithang Monastery was ablaze, if we are to believe China’s propaganda agency, Xinhua, the cause it claimed was a faulty wiring problem. The question looming here is are we witnessing an unfortunate series of accidents, some tragic coincidence of electrical malfunction or a politically motivated arson, instigated by a regime that views Tibet’s religious centers as breeding grounds for dissent and resistance against China’s tyranny?